Hello everyone, I would like to take the time to inform you that Just FACS now has products! Don’t worry, I will still be providing free and new resources as well, but there will also be new products to supplement and enhance the free lessons and vice versa. I am very excited about this and it has been a lot of hard work, but the first release is done. Definitely keep a lookout for bigger and better things to come from Just FACS such as a ton of more resources, give-a-ways, products and much, much more! 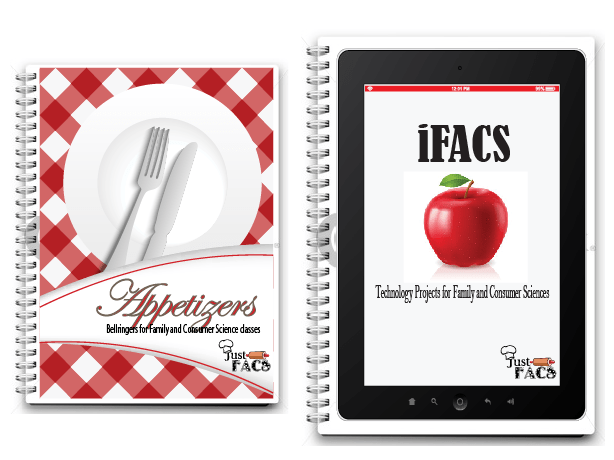 Our first two products to be released are “Appetizers” which contains several bellringer activities for all areas of FACS and “iFACS” which contains over 20 different technology projects tailored to all areas of FACS. Check back later for how I plan on celebrating my entire birthday month, it’s going to be great! To check out our newest products, click on the Da Goodie Shop link above or here. ← Just FACS opens C.A.F.E.